A romantically stylish off the shoulder Bardot top, perfect for hazy summer days. 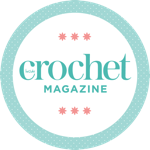 This pattern by Emily Ashbourn is available inside issue 104 of Inside Crochet. Not a subscriber? Order a copy online and download a digital edition straight to your smart device. www.makeeshop.com and on Instagram @make.e.